No, really. You can call me Donut. During our summer spent working at Point O'Pines Camp for Girls in upstate New York, my kindred spirit Leslie lovingly bestowed that flattering nickname upon me. And lest you think I earned the nickname by making clever donut jokes or working at Dunkin' Donuts or regularly bringing donuts to my coworkers, I should clarify that it in fact had to do with the simple fact that I ate so, so many donuts. I still eat so, so many donuts - that's why I have to go to the gym every day. 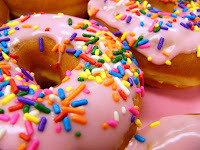 Last week the website The Daily Meal: All Things Food and Drink published an article highlighting America's Best Donut Shops. Or American's Best Donut Shops according to their researchers, who couldn't have have been very thorough in their investigating/taste testing because they didn't include any of my top donut shops. They should have asked for my input - I've done A LOT of research and could have steered them in the right direction - but since they didn't, I thought I'd share my two cents here. If you're ever in any of these cities, it would be worth your while to stop by for a breakfast (or lunch, dinner, or snack) donut. Tell them Erin sent you - they'll remember me.